In the army | Outfits - Do You Speak Gossip?Do You Speak Gossip? You may have already noticed, that this year I have a slight obsession over monochromatic looks (you’ve seen a total monochromatic look of mine here). When I got these 2 army green/khaki pieces from H&M, I couldn’t wait to wear them together. I was actually looking for a pair of khaki jeans for a long time, to combine with my high heeled brown booties spartoo. So when the temperatures fell a lot last week, I jumped at the opportunity to wear them all together. Seriously loved that look! I hope you enjoy the photos. Όπως μπορεί να έχετε ήδη παρατηρήσει, φέτος έχω πάθει μια μικρή ψύχωση με τα μονόχρωμα σύνολα (είδατε ένα τελείως μονόχρωμο look μου εδώ). Όταν αγόρασα αυτά τα δύο χακί κομμάτια από το H&M, ανυπομονούσα να τα φορέσω μαζί. Μάλιστα, έψαχνα εδώ και πολύ καιρό ένα χακί τζιν για να το συνδυάσω με τα ψηλοτάκουνα καφέ μποτάκια μου. Μόλις η θερμοκρασία έπεσε αισθητά την προηγούμενη εβδομάδα, άδραξα την ευκαιρία να τα φορέσω όλα μαζί. Ειλικρινά, το αγάπησα αυτό το σύνολο. Ελπίζω να απολαύσετε τις φωτογραφίες. εχεις κανει καμια αναρτηση με το πως φτιαχνεις ετσι τα νυχια σου?!?! Και εγώ έχω φάει ένα κόλλημα με τα μονόχρωμα και δύχρωμα σύνολα από το χειμώνα. Στο τελευταίο μου μάλιστα φορούσα head-to-toe burgundy! Όχι δεν έχω κάνει κάποια ανάρτηση για τα νύχια μου. Αλλά είναι πανεύκολο! Ίσως κάνω κάποιο tutorial την επόμενη φορά που θα το δοκιμάσω. Είναι το ίδιο που είχα όταν βγήκαμε. γιατι δεν το κανεις σε βιντεο!!?!? ναι το θυμαμαι αυτο το ποστ! σε αυτο ειναι που μαρεσαν τα μαλλια σου!! να τα ξανακανεις ετσι καποια στιγμη!! Pros to paron, den exw to xrono na to psaxw me videakia…ntrepomai para poli na vgw on camera kai na milisw, kai prepei na mathw nea progammata klp klp…Isws sto mellon…alla pros to paron mono fwtografies. Love, love , love it!!!!! I am a fun of monochromatic outfits! Me too! 🙂 Thank you Eirini! Πολύ ωραία η λεπτομέρεια στην τσέπη του πουκάμισου! Nai kai mena auti me kerdise nomizw 🙂 S’euxaristw poli. Great look once again my dear. Totally love it! Thank you very much! I’m glad you liked it. prospathisa na afisw comment sto blog sou, alla itan adinato kathws den exw google + account… Den iparxei kapoios allos tropos gia emas pou den exoume? Krima, na min mporoume na afisoume sxolio. S’euxaristw poli gia ta sxolia sou olo auto to diastima. Distixws den mporousa na apantisw nwritera logw provlimatwn me to PC. Such a chic solider! I haven’t tried the new monochromatic thing just yet, but you my dear have done it so in style, I’m thinking maybe all white, love your boots they go with everything! Khaki is one of my fave colours, I did a monochromatic look like this too so I’m definitely a fan! The monochromatic look is great! Thank you! I’m glad you like it too..
Hey M! Love your military chic look, those killer boots look amazing although I don’t think you could win any wars wearing them! I’m a big khaki fan, I just ordered a khaki maxi dress for when summer eventually puts in an appearance! Are you a fan of maxi dresses? 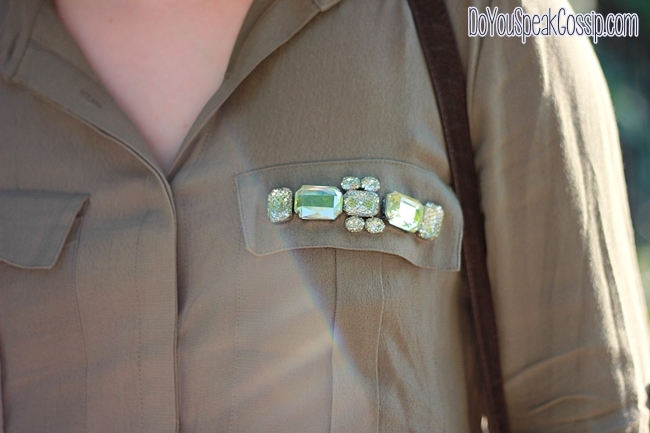 Just can’t recall seeing you wear one but sure you’d look fab. Hey Laura! Thank you very much. I’m always glad to see one of your comments. I’m sure these boots are not good for war situations. 😛 hehe They’re really beautiful but their heel height makes them a bit uncomfortable. Can’t wear them for many hours, at least not yet. I still have to get used to them. Every shoe, and every heel is different. Kai egw pleon agapw poli tis monoxrwmies….Kai genika eimai tis genias tou matchy matchy, logw tis mamas pou panta me parotrine na sindiazw tsanta me papoutsi klp klp. An kai pleon den to kanw, panta psaxnw simmetria sta look mou. Το army εγώ δε το τολμώ αλλά το έκανες να φαίνεται εύκολος συνδυασμός..
Ντάξει. Τα νύχια ειδικά υπέροχα! Σε προσκαλώ στο giveaway μου! Me tin prwti eukairia tha perasw apo to blog sou! You look amazing! Oh, wow, these boots are fantastic! And I love the color, the outfit! You always look so elegant and chic! So, if I am writing it means I arrived 🙂 Tired but I arrived! Will write tomorrow or so, I am now kind of sleeping a lot 🙂 Makia! your hair color is just perfect for this color combo. It’s stands out so beautiful! Such a great casual cool look. themodisher.gr recently posted..I’m a Barbie… NO! how did i miss this, love this outfit and those boots are amazing m! 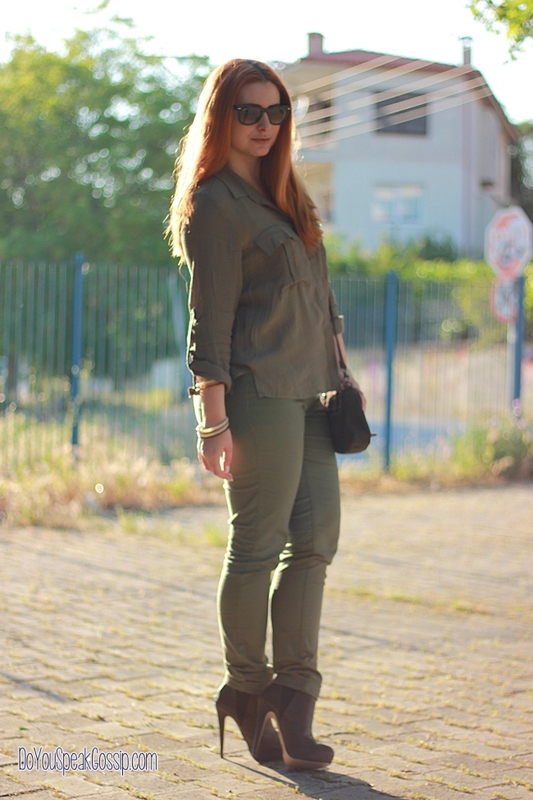 Pingback: Monochromatic army green | Outfits | Do You Speak Gossip?